Brought to you by the Merchants of Five Corners Shopping District and the White Rock BIA, the Five Corners Block Party happens this Saturday, July 16th from 10am to 3pm! This all ages event has become the party of the summer for the merchants and community to come together and have a great time. This year it promises to be bigger than ever! The Five Corners Block Party includes an international music event live on stage on Prospect Avenue, a marketplace and sidewalk sales along Johnston Road to Pacific Avenue, the local Farmers Market will join the party this year along Pacific Avenue and the ever popular Family Fun Zone will be located at White Rock Elementary school grounds. Stay for the day enjoy the fun, shopping, music and excitement. Hang out after the party to watch the amazing Tour de White Rock Criterium which starts at 4pm. It is that time of year again! Yes, the Tour de White Rock is back! This exciting annual event is proudly organized by the City of White Rock for all to enjoy. White Rock saw its first race with 35 riders and 20 volunteers in 1980. Now the Tour de White Rock is an international race event attracting over 150 high caliber cyclists from across Canada, the United States and Europe! Join the action on the official facebook page of the Tour de White Rock! Please note parking will be limited due to road closures around each event. Arrive early, pick your spot and enjoy the spectacular athleticism of the professional riders! FloMotion Fitness + Yoga Studio: Tuna for Training ~ Help Stop Senior Hunger: "The FloMotion Team is at it again! This time raising much needed food donations to help White Rock/South Surrey seniors who are in dire need..."
Five Corners Shopping District is now online supporting the merchants and community of Five Corners. We will post news, events, updates and exciting happenings in and around our cool, hip community. Stay tuned!! Make sure to check us out on Face Book and follow us on Twitter to stay up to date on all things Five Corners White Rock! 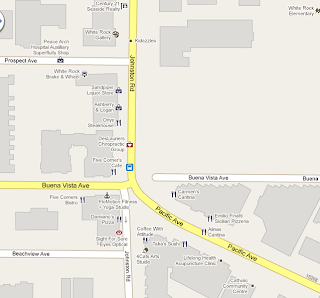 Welcome to the online resource if you live, work or play in the Historic Five Corners Shopping District of White Rock. Our mission is to keep our community connected, thriving and engaged in all things in, around and about the Five Corners Shopping District. Hilltop Plumbing & Heating Ltd.
Five Corners Shopping District. Simple theme. Powered by Blogger.